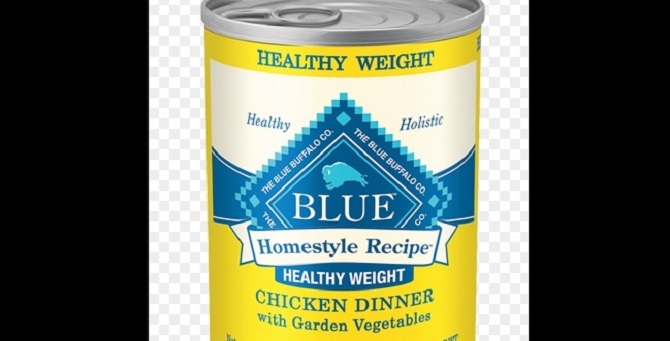 The Blue Buffalo Homestyle Recipe Heal;thy Weight, Chicken Dinner with Vegetables has been recalled due to metal bits found in the product. Attention! Blue Buffalo has done a voluntary recall of their very popular Homestyle Recipe Healthy Weight canned food. The recall marks the third recall this week by a dog food manufacturer because of bits of metal being found in the food, presenting a choking hazard. Blue Buffalo has made it very clear that this is the ONLY one of their products possibly affected, and they were even able to narrow the issue down to one particular lot of cans. So far, thankfully there has been no deaths caused as of yet, but the company is doing whatever it can to ensure the health and safety of their customers and their dogs. Blue Buffalo has not provided a specific area or region of the country that the products in question have been shipped out to, so anyone who regularly feeds their dog this brand of food should be sure to check the information on the can to see if it matches the recall. Blue Buffalo advises anyone discovering that they have a can of this flavor of their food to return the products to the location from which they were purchased. There is also a customer service, toll-free line for inquiries which can be reached by dialing 1-866-800-2917. For more information on dog food recalls and how to file a complaint in the US and Canada against a dog food company, you can visit www.dogfoodadvisor.com, or visit the USFDA’s website by going to http://www.fda.gov/petfoodcomplaints. Canadian citizens can fill out a Consumer Product Incident Report Form by clicking here. Oh my…so many dog food recalls recently! I hope everyone stays safe and keeps an eye out for these things! Thank you so much for sharing with us, this is very important! This is why I home cook for my fur babies.